"When the wires from the west meet the lines from the east, we are through." Gene Autry starred in 89 feature films during his long and active career, and thus far about half of them have appeared on DVD in the Gene Autry Collection. This disc takes us to the very end, with the last of Gene's theatrical releases. Although the story offers some promising possibilities, it falls into clich� a bit too readily to be fully satisfying, the running time is highly abbreviated at under an hour, and it's a little short on musical numbers, too. The story finds Gene in a very specific historical setting, as a rider for the Pony Express (never mind that they actually used youngsters for this task) in its waning days, about to be eliminated by the transcontinental telegraph and improved conditions that allow reliable stagecoach lines. Gene is a rider for Tom McEwen (John Downey), but he sees the writing on the wall and saves up to buy himself a stagecoach. When Tom finds out, he's furious and fires Gene, leaving young Johnny Blair (Dickie Jones) to pick up the slack. But evil banker Clyde Vesey (Howard Wright) has his own ideas: he intends to get the mail contract for his own stage line, and will resort to murder if necessary to get it. This was the end of the line for Gene and Smiley Burnette as well, and it shows a bit. Gene isn't terribly convincing in the fistfights, though in his defense one of them feels tacked on to generate a little excitement in the otherwise dull first part of the picture. Things get better toward the end when he's forced to fight one of Vesey's henchmen with his feet tied together, while sidekick Smiley is less than helpful, though well meaning. Smiley isn't carrying his substantial weight well, and his comedy bits feel labored. It was probably just as well that the long-running series shut down at this point before it got any worse. The setup offers some interesting possibilities, especially as Tom feels betrayed by Gene's good intentions (he intended to offer partnership in his new stage line to Tom), and there's a definite flavor of the changing of the guard that's metaphoric for the decline of Autry's style of musical Western in theatrical films, though the Western itself would gain a new lease on life via that newfangled television contraption. It's really too bad that writer Ruth Woodward couldn't come up with something more substantial than the hackneyed formula about the loss of the mail contract if the rider fails to get through. Former child star Jones is quite good for the most part, with some petulance of adolescence and insecurities, especially when he begins to believe, at Vesey's behest, that Gene is trying to steal his girl, Tom's daughter Katie (Kathleen Case). Case isn't bad, and she has a dancer's gracefulness that's visible on the screen whenever she's around. She ended up a disaster, however, with an iffy career climaxing in a drunken car wreck in 1967 that killed actor Dirk Rambo. Fans of Gene's singing are likely to be disappointed, since only the songs Sing Me a Song of the Saddle and Sugar Babe are present in the film. Both are catchy enough, but hardly major Autry tunes. Image Transfer Review: Although the restorations in the Gene Autry Collection have always been attractive, Last of the Pony Riders looks exceptionally good. There's hardly a speck to be seen, and no serious damage of any kind is visible. Greyscale is first-rate, and texture and detail come across nicely. Even the exceedingly difficult small checks of Smiley's shirt look quite good, with only mild aliasing and shimmer visible. There are no complaints here whatsoever. Audio Transfer Review: The mono audio is reasonably clean and quiet, if undistinguished. The songs come across well but without feeling out of place in the surrounding audio quality. The foley effects don't seem overwhelming as they all too often do in B Westerns. Extras Review: Once more there's a fine panoply of extras in support of the picture, starting with the Melody Ranch Theater segments (11m:06s) with Gene and Pat Buttram. They talk a bit about the real Pony Express, and then wander into some lame postman jokes. The Melody Ranch radio show presented here dates from March 14, 1954 and includes an ad for Last of the Pony Riders, even though it had been released in November of the prior year. A still gallery offers about six dozen photos, and there's also a gallery of a full set of lobby cards and another of selections from the pressbook. Some scant production notes are included too. One oddball extra that we haven't seen before on these discs is the Spanish-language version, with translated title cards (under the title Cantero Rural) and primitive subtitles. It's slightly windowboxed. It does seem a shade odd to have the same movie on the disc twice, once with burned-in Spanish subtitles. I was a little let down that Jones didn't contribute a commentary to this title, since he did such a fine job with his remarks on The Strawberry Roan. And the trailer is again missing for some reason. The Centennial Extras include the last two chapters of Gene's first starring role, the sci-fi western serial The Phantom Empire, featuring the world's clunkiest robots and lots of electrical gizmos blowing up. Once again, the prints are better than the usual PD versions, and it's supplemented by its own gallery of stills and an overview of the serial. 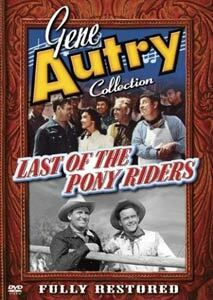 Gene rides into the sunset with an interesting concept, and the Gene Autry Collection marks the end of his centennial year with another overstuffed DVD. The transfer is one of the best yet in the set.